This guest post is written by Amanda Genther. She helps you launch profitable online courses and eBooks. When you can't find many clients and you're struggling to sell your services, it's useful to have passive income you can fall back on. To create passive income, you need to launch eBooks, courses of products. But how? And where do you start? Amanda is here to shed some light on the topic! Online courses and passive income are a hot topic right now, and I’ll bet that you’ve got a whole notebook full of ideas just waiting to get out into the world. Amiright?! But what happens when you’re completely confused by all of the tech tools involved to launch something? One of the biggest hangups being how to design your sales page and membership site.... without being a techy. Because the fact is: the content and your people are what you should be focused on, not the technology. This is THE tool I recommend to my entire community and anyone wanting to learn how to easily design their own sales pages and membership sites, regardless of whether you’re a designer or know how to use Photoshop. It also helps those with smaller budgets get on the same level playing field as those who can outsource their design work, because it’s affordable and easy to use. First, you’ll want to make sure you have a fresh domain set up with Wordpress installed. I recommend watching this awesome step-by-step video from Michael Hyatt to setup your domain, hosting and install Wordpress. 2. Once you purchase, follow OP’s Ultimate Getting Started Guide for step-by-step instructions for installing OptimizePress onto your website. 3. Once you have OP installed and the basics setup, I recommend playing around by creating a new page. The easiest way to design new pages is to use the Live Editor, which allows you to see the changes as you’re making them. 4. Choose a pre-installed content template or choose one from their shop for the new page you’re creating. If you’re creating a sales page, they have pre-built sales page templates you can use. Same goes for membership site pages, squeeze pages and so much more. 5. Add your content to the page, upload graphics and images (I recommend Canva for designing your own graphics and icons) and customize your colors and fonts. Just like any other technology, OP does have a slight learning curve, but after a few pages and a few hours of playing around with it, you’ll start to feel a lot more comfortable. And eventually, you’ll be whipping out gorgeous sales pages in a matter of hours. Keep it simple to start. If you aren’t a designer, I always recommend to keep your sales pages and membership site designs simple by using the built-in content templates that come with OptimizePress. At this point, I only recommend adding your own content and changing the colors and fonts to match your branding. As you get more comfortable with everything, you can start to get fancier with the design. White space is your best friend. Don’t be afraid to add a lot of “padding” to your copy and images. The “padding” I’m referring to is all of the white space used on your sales pages and membership sites. White space gives your content some room to breathe and makes it easier for your readers and customers to follow the page and no what to read next. Bunched up text on a page is hard to read and will cause more people to exit the page before they finish reading, which could result in less sales for you. Use lots of visuals throughout the page. Once I get done adding all of the content to sales pages I design for my clients, I go back through the entire page, section by section, and ask myself, “How could I say this visually?”. A crazy statistic I came across a year ago says, “Visuals are processed 60,000 times faster to the brain than text”, which means that it’s much easier for your readers to consume your content via visuals than by reading, so always try to make your sales pages and membership sites as visual as possible. By using OptimizePress, you get to take your branding and product launches back into your own hands, so you no longer have to wait on a designer’s timeline to have room for your project or shell out $4,000+ for a designer to create a custom sales page and membership site for your course. It only takes $97 + time invested learning how to use the tool. 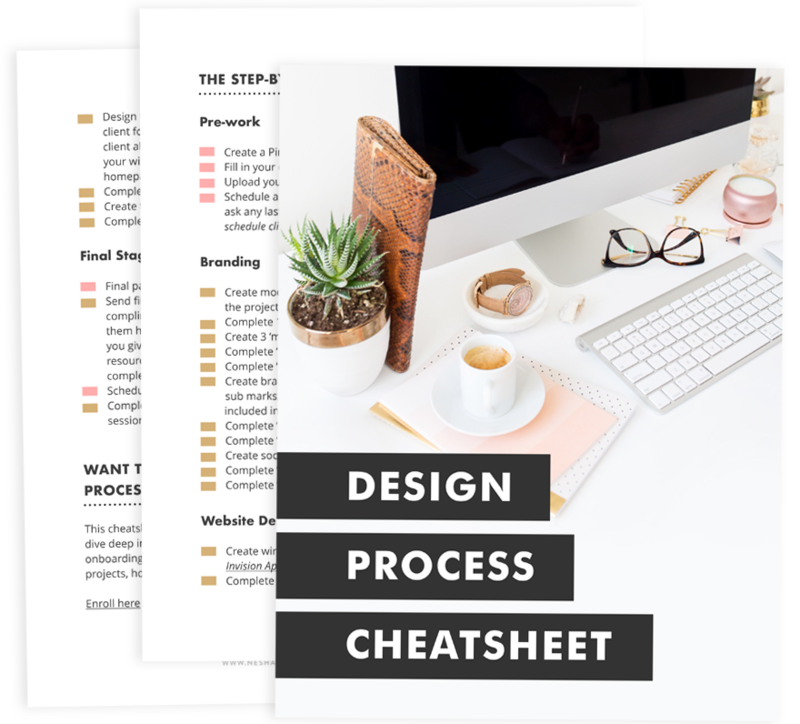 Amanda Genther helps purpose-driven women entrepreneurs bring their ideas to life by providing personality-inspired design + next-level strategy for their online courses. She is also the creator of Irresistible Sales Pages, an online course that teaches women entrepreneurs how to become their own sales page stylists so they can launch with confidence and make more sales. And that list was ranked in order. As you can see, after referrals from my clients and other designers, social media brings me lots of clients. In fact, my most recent inquirer found me via Pinterest. It just proved to me that I needed to continue putting effort into pinning my work onto Pinterest and taking Pinterest seriously. I occasionally do consult calls with freelancers, and a lot of them tell me they don’t know how to get clients from social media. So I’m here to shed some light on the actually-pretty-simple technique. A year ago, I hardly ever logged on to Facebook. I had a Facebook page that I never used because it didn't drive much traffic to my site, and I was in a few Facebook groups but never actually participated in discussions. I was one click away from deleting my Facebook account forever. Fast forward one year and my business makes a lot of its money via Facebook groups. There's a tendency among freelancers to focus on getting more likes for your Facebook business page. But because of Facebook's algorithm, not everyone who likes your pages actually sees what you post. That means the chance of actually getting clients via your Facebook page is super slim. I focus on Facebook groups instead. Facebook groups are only beneficial when they serve you and help you. So look for groups have daily discussions with plenty of comments, and are filled with potential clients or people with the same job as you, and groups that aren't just filled with promos. Be active. Actively participate in discussions. Facebook groups- the right ones- are gold mines filled with potential clients. But if you don’t actively comment on threads and make your expertise known, no one will know you’re there and no one will inquire about your services. You don’t have to be on Facebook 24/7. Do what I do- dedicate an hour each day to it. Don’t be salesy. The thing Facebookers hate the most is spam, so don’t spam groups with your services and products. Some groups have certain days where you can post about your services, so be respectful and stick to those days. If you find a group that doesn't specify a day for this, post about your services very sparingly. I find quality clients from Facebook groups such as the Biz Designers group. In fact, I booked two clients from that group this year and they purchased my Luxury Brand package and my website design package. Result! I don’t book as many clients from Twitter these days, but when I was freelancing part-time I booked 6 clients in one week from Twitter. It was the turning point in my life where I realized I could actually make money from freelancing. It was the point when I realized I was kind of good at this marketing stuff. When I booked 6 clients from Twitter, I tweeted 3-5 times a day about a (cheap) special offer I was selling. If you’re selling smaller packages and lower-priced services, Twitter is a great platform for you. Ah, Pinterest. My favorite social media platform of all. If you create anything visual, like websites or logos, then Pinterest is the perfect platform to get your work seen. But I personally think that Pinterest only works best when you have a blog. Most of my website traffic comes from Pinterest- it’s my second biggest referrer. So not only do potential clients see my design work pinned on Pinterest- they also see my blog posts. And when they click-through to my site, they see I offer design services. You’ve probably noticed that I haven’t included Instagram in this roundup. That’s because I’m still playing with Instagram. I’ve never really taken it seriously and it has never sent clients my way, but I know it brings some people a lot of clients. So if you’re interested in Instagram marketing, I recommend checking out Alex’s post on Instagram marketing. So, when should you post on social media? Should you have a schedule? Yes! You should! I've never been great at sticking to a social media schedule so I created this one today. I'm going to follow it; maybe you can too! I optimized this schedule by researching the best days to post on social and implementing T.A McCann's 5-3-2 rule. According to McCann's framework for posting on social media, out of every 10 posts, 5 should contain content from others that is relevant to your audience, 3 should be content from you, and 2 should be personal posts. Awesome framework, isn't it? It's really easy to make friends with other creatives in your industry. You can tweet them, chat with them in Facebook groups, email them... the list goes on! If you strive to make genuine friendships, you'll find that those friends will start sending work your way when they're booked up. The best way I make friends with people in other industries (like writers and photographers) is promoting their posts and services, or including them in a blog post. In fact, a copy writer I included in a blog post this year emailed me yesterday asking if she could refer me to her clients. Pretty awesome, huh? Some businesses have referrals programs where they refer clients to you and take 5-10% of the earnings you make from that client. Depending on how much you charge, this could be a really great way of gaining some clients. If you don't know anyone who runs this kind of program, ask around on Facebook or start one of your own! This should be one of your main goals. When my clients walk away from our time together, I want them to be so pumped and excited that they yell my name from the rooftops! So I go above and beyond to make them happy. I don't let them walk over me, but if the project is ending quickly I throw in extra revisions. I reply to their emails quickly. I send them a card when their project is over. You get the point! If a client thinks you've done an amazing job, they'll have no problem with recommending you to others.